This guitar has its specifications listed as 21 frets yet all the photos on the site show it as a 22 fret guitar - which is it Monoprice? BEST ANSWER: Thanks for pointing that out. We will fix the site spec. I have this guitar and it has 22 frets. What makes these twice the guitar that the Retrovision was? Or did they just decide they could charge double when the Retrovision was a success? BEST ANSWER: Thank you for your interest in this guitar. The new Indio Guitars are better from the ground up. Real veneer flamed and quilt maple tops, hardware, woods, and overall build quality is greatly improved over the previous model. I promise, you will not be disappointed. Hey Dave, I appreciate the reply, and the improved build quality and hardware. 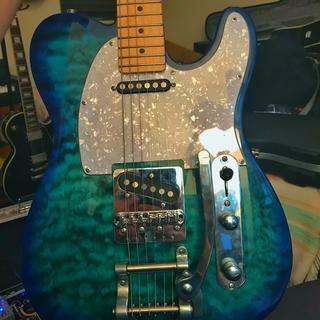 But you guys must be aware that most Tele and Strat players are looking for an instrument that has a similar vibe to a Tele or a Strat, neither of which is known for translucent finishes or quilted tops. Wanting to offer higher quality is awesome, but from a marketing standpoint I think the finish choices are a miss. Best of luck. These are string through body which improves resonance. 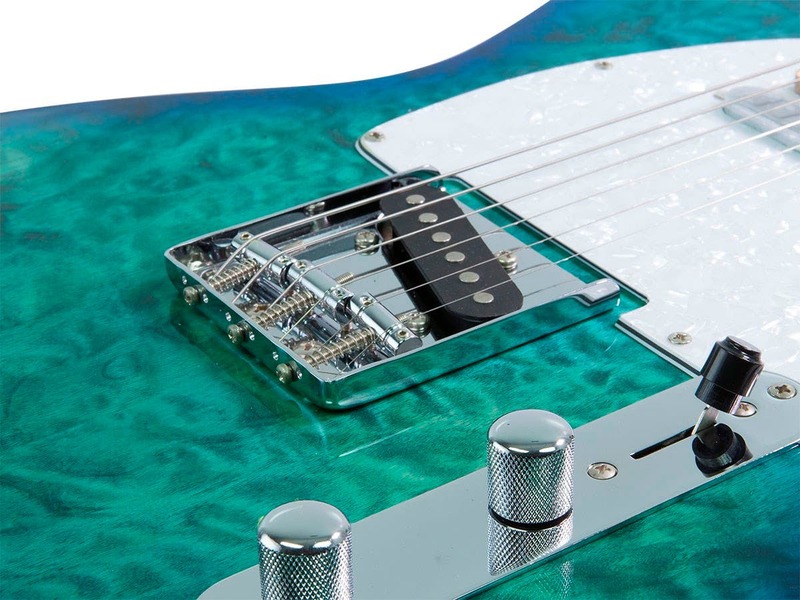 This guitar is also color changing it goes from blue to green to turquoise depending on light. Also, it has a beautiful maple neck and the frets are well dressed. Are the pickup magnets alnico or ceramic? BEST ANSWER: I didn't look at the neck pup, but the bridge is ceramic; assume the other is also. Also be prepared to swap out the stock bridge saddles for compensated ones. It has the classic tele intonation problems. Otherwise nice guitar for the price. Actually the intonation on mine is very good. I used a really accurate tuner to set it. What pickups are in the Indio Tele? BEST ANSWER: All of our Indio guitars use ceramic pick-ups. The DLX models are wound a little "hotter" for more tone and output. I couldn't tell you the manufacturer but bot are single coil , the bridge being a slanted strat style pickup and the neck being a lipstick style. All I can say is you can't go wrong buying this guitar. They are amazing. Mine required a good setup with new strings, but it was easily accomplished and I actually play this guitar live as my #1 axe! I have loads of vintage Fenders and Gibsons , Strats, Les Pauls, etc but I friggin' LOVE this guitar. Go figure. I just played another gig last night with mine and I have to agree, this is a really nice guitar. I like it much better than the 1970 Fender Tele I had that weighed a ton. I can't help wondering what it would sound like with different pickups, but it sounds good as it is. All I did was install a Tusq nut, the spacing was a bit off. 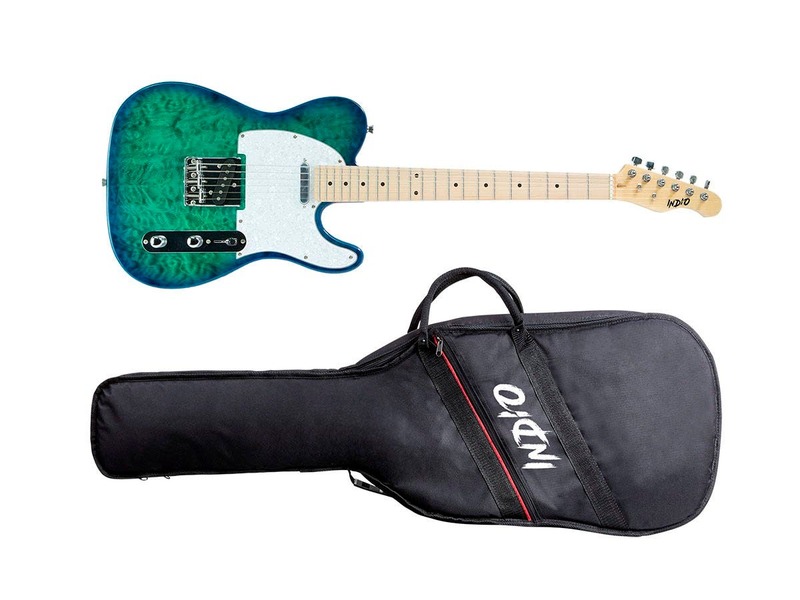 What is the neck radius of the Indio Retro DLX Quilted Maple Top Electric Guitar (610454)? BEST ANSWER: neck radius of the Indio electric guitars is 9.5". Are the Indio guitars going to be professionally setup by a luthier, like previous Monoprice guitars? BEST ANSWER: Thank you for your interest in these new guitars. All Indio DLX guitars will be inspected and set-up by our luthier here in Southern California. what size are the frets? BEST ANSWER: Thank you for your interest in these Indio guitars. The frets are all jumbo. Unfortunately not, we would not offer preorders or shipping options other than what is shown on the checkout page. What is the neck shape and neck thickness? BEST ANSWER: Thank you for your interest in the Indio guitars. The neck is C shaped with 9.5" radius. 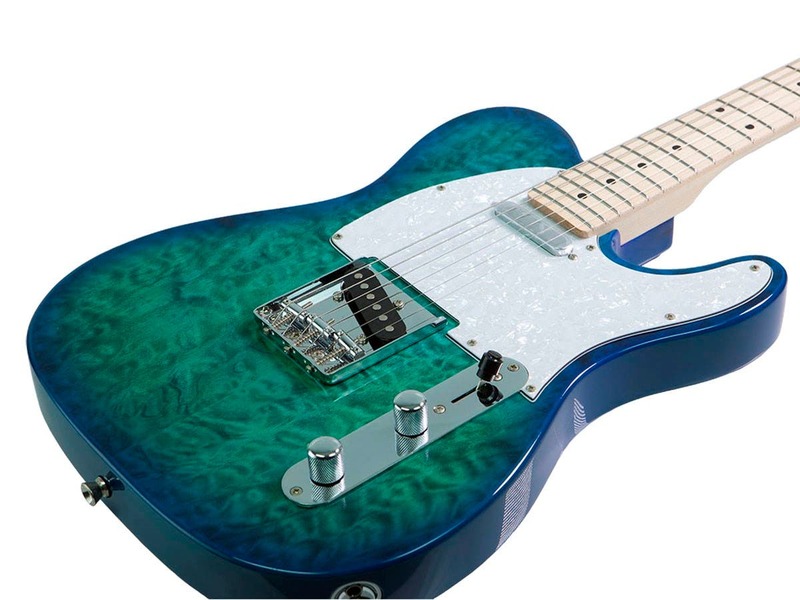 How does this guitar compare to the squier tele ? SQUIER CLASSIC VIBE 50'S TELE IN THE VINTAGE BLONDE FINISH. TO ME, THIS IS AS GOOD OF A GUITAR IF NOT BETTER THAN IT WAS. HOPE THIS HELPS. I LOVE IT! What are the measurements of the neck pocket? i have a new roller bridge but its radius is 12" so ill need a new 12" radius neck to accommodate it since the neck the guitar comes with has a 9.5" radius. Do you have any tele model with the 7.25 inch radius? Would anyone know how thick the maple top is? Got this on sale 20% off, absolutely great for the money. Slight tweak of the truss rod, raised the front pickup a little and it was perfect. Great build quality, great playability after a minor adjustment, and looks great too. Unbeatable for the price. Very good quality, nice finish. Better than expected. Played it hard and it stayed in tune, great guitar for the price. Good value, but what do you expect? Bought this on a whim. Not really a big tele fan, but was willing to spend a little for what would probably become a project guitar. If you're looking for a good starter guitar, go for it, it's a very good value. 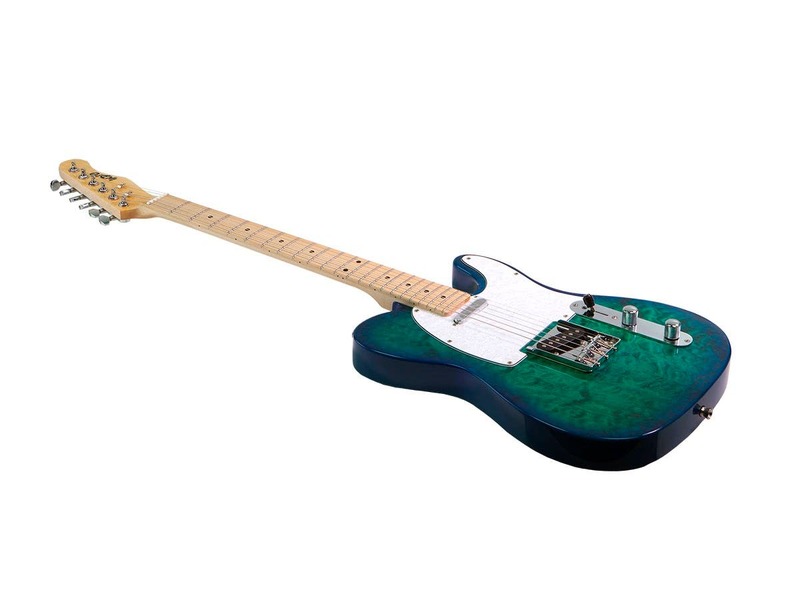 If you've been playing for a while and think this is going to become your #1 and replace that MIM or MIA Tele.. well, maybe after some upgrades. The wood on these guitars are great. Beautiful quilt and dye (paint?) job. The neck is smooth, though the frets needed a good dressing as they were sharper than I like them to be. The electronics, well, that's where they lose a star for me. The jack screws were stripped out and the tip wire was loose. Easy fix, but didn't expect that right out of the box. The tone pot is really scratchy. All things I most likely will replace anyway. I'd buy another if it was on sale. Fantastic value! Nice, meaty Tele. Would be 5 stars but, upon arrival, I was disappointed that the blue color I ordered was more like greenish in the center and tapered to blue on the edges. Really, REALLY wanted the blue like it was in the picture. But after changing the strings and playing it, I quickly got over the not-so-cool color. The signature tele sound is all there. Easy to play, melts in the hands. Easily a $800-1000 value, with maybe the exception being the control knob sensitivity. Not a smooth arc from 1 to 10. Hyper sensitive between 1-3. A common thing with cheaper pots. Good guitar for the price. Some of the fret edges on mine are sharp and rough. So it needs some luthier work to be comfortably playable. I had read other reviews warning about some green in the blue but I was still shocked at the color when I first saw it. Mine is mostly green with blue just around edges and doesn't look anything like the pictures. I'm very disappointed in the color. I would not have bought this if I had first seen an actual picture of what I got. Overall I am happy with this guitar for the price. It did need a setup. The action was good, but the intonation was way out and the truss rod needed a tweak. The string ferrules in the back all fell out when I took off the old strings. I glued them back in. The fit and finish is very good for the price. It does have a bit of a greenish hue towards the middle of the body, but it looks nice. The dots at the 3rd and 5th frets don't line up with the strings. I'm not sure if it is the nut, but it seems to play fine.I haven't gigged with it yet, but it sounds pretty good at home at low volume. The middle setting on the pickup switch is hum canceling, a nice touch (hear me, Fender?). Also the neck is matte finished but the front of the headstock is glossy, unlike on my American Strat. Another nice touch. the tuners seem smooth and solid. the neck feels to me like a Mexican Fender, and the fretwork is pretty good. I would recommend it if you don't mind doing a few tweaks. Came well boxed with no damage. Out of the box it needed minimal setup and the stock pickups sounded pretty good. Creamy neck and spanky bridge like a Tele should sound. I added a B5 bigsby, new pickups/wiring, locking tuners, and a roller bridge. I also leveled and crowned the frets and did a pro setup. I would put it up against any USA Tele be confident it sounded and played just as good if not better. The finish is the best part... such a head turner. I get nothing but compliments on it. I will probably replace the neck at some point, not because of any problems...the stock neck is perfect, I just found a custom flamed Birdseye maple neck that would look amazing on it and give it a real custom shop feel. All of my upgrades, hardshell case off CL, and the guitar itself included and I’m still under $400 for a professional guitar. Couldn’t be happier. There are divots in the Frets where it looks as though the strings were pressed it down very tightly against. Multiple Frets along the neck are affected..
Quality Control appears to be none existent! 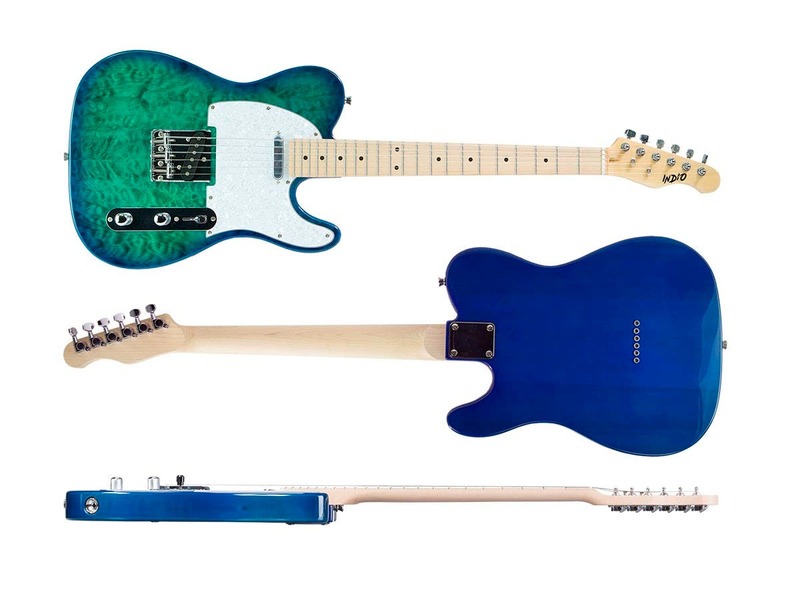 Buyer beware when buying the trans blue color of either the Telecaster or Stratocaster knockoffs. I have bought both and have sent one back and now sending the other. The color of the trans blue is green with blue trim therefore it's blue-green and in my opinion it's is ugly. I was told by Monoprice is aware of this issue. Both guitars had sharp ends on the frets and they are far from being jumbo or even medium. They are the most narrow frets I have ever seen. 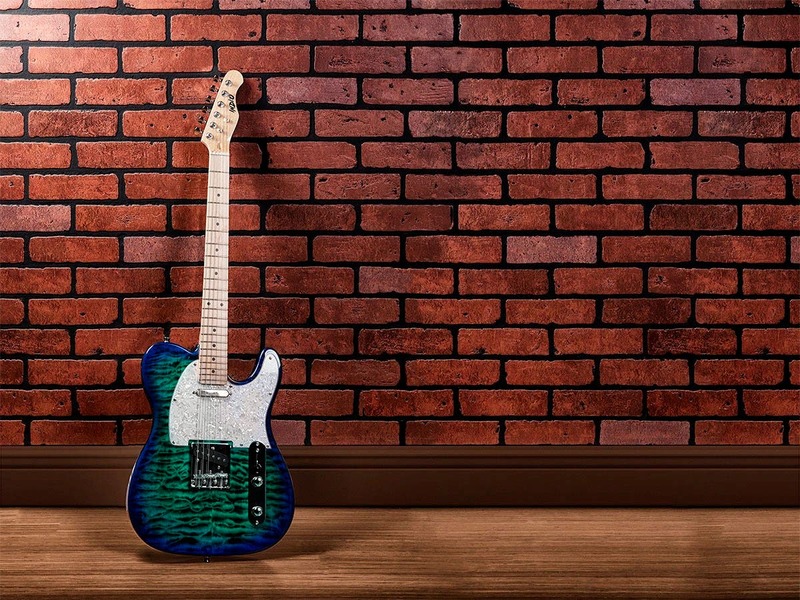 It's a shame cause the quilted top is book matched very well and it has a Wilkinson tremelo on the Strat model but the color is down right nasty.